This weekend I added some sweet details to my niece’s 9th birthday party. I got to be in charge of the things I love best, the sweets and the favors! I set up this little dessert table to display the treats together. Forever inspired by Amy Atlas and my good friend Sharnel, I always start planning a party with lots of grand ideas. But somewhere along the way, a pesky little thing called a “budget” often gets in my way! 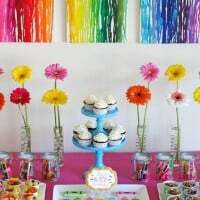 For this party, I used dishes, linens and ribbon that I already had on hand, and kept the entire cost of the sweets and favors (for 8 girls) under $40.00 (all the details at the bottom of the post). I filled two pretty candy jars with sweets, one held strawberry marshmallows, the other was filled with strawberry cheesecake flavored Jelly Bellies. We served strawberry lemonade in some cute cups I found this week at Michael’s (for $1.00!). 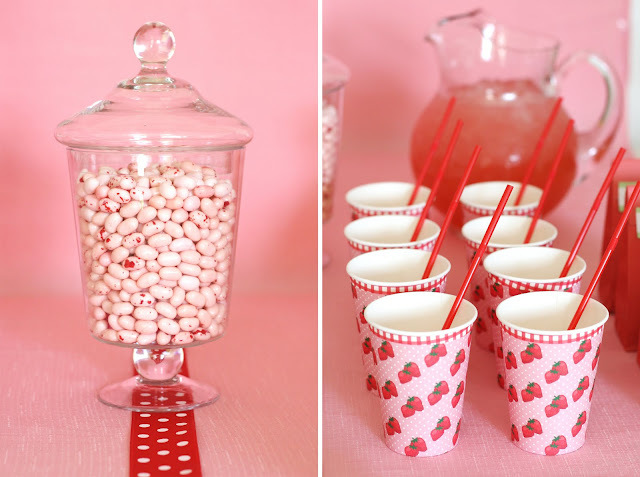 When my niece first mentioned wanting a strawberry shortcake party, I knew I had seen some cute little (strawberry shaped) bottles of bubbles at the dollar store. I dressed them up with some custom tags I made, and a bit of pretty ribbon (the tags read “Thank you berry much for coming to my party! Love, Mary”). The little guests each got one bottle of bubbles and a little paper sack of sweets (containing a mix of strawberry candies). The bags were sealed with labels I designed and printed on adhesive backed paper. The mommies got a little favor too, a basket of fresh strawberries (picked by my sister and myself). 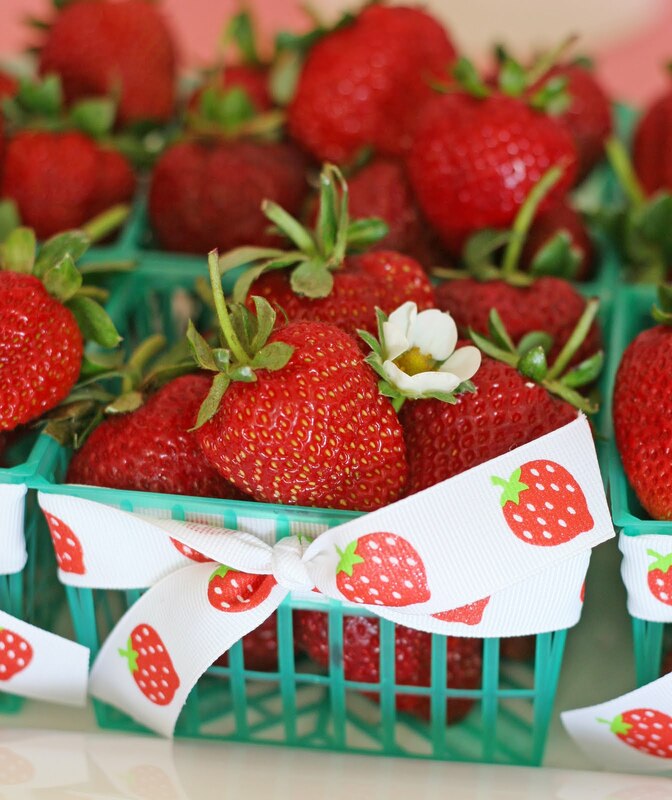 Even the strawberries got dressed up with ribbon! 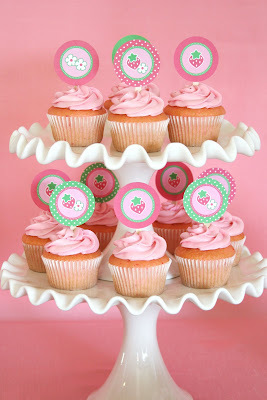 Last year I did a Strawberry Shortcake themed party for my “baby” (now 3), and I made the cupcakes below. I made the little strawberries, leaves and flowers from fondant. 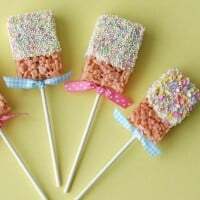 These would have worked perfectly for my niece’s party too, but sometimes a 24 hour day is just not enough to get it all done! Update: To answer the question many of you have sent in… The center cake plates (with the ruffled edge) were a set I bought at Costco earlier this year. As far as I know they were only sold for a very short time, and I haven’t been able to find them again. Sorry! this is probably the best dessert table i've ever seen . mind if i reblog ? sorry about the link ! This is absolutely stunning. I love all of the details and simplicity of it. You did an amazing job on this table. How did you do the tablecloth? Is it a polka dot full cloth with a pink topper? So, so sweet! You are so talented. No wonder why people want to claim these as their own! But, I saw them here first and I sure won't forget your talent any time soon. You are very creative! You did such a great job…and I can't believe you did it on that budget either! 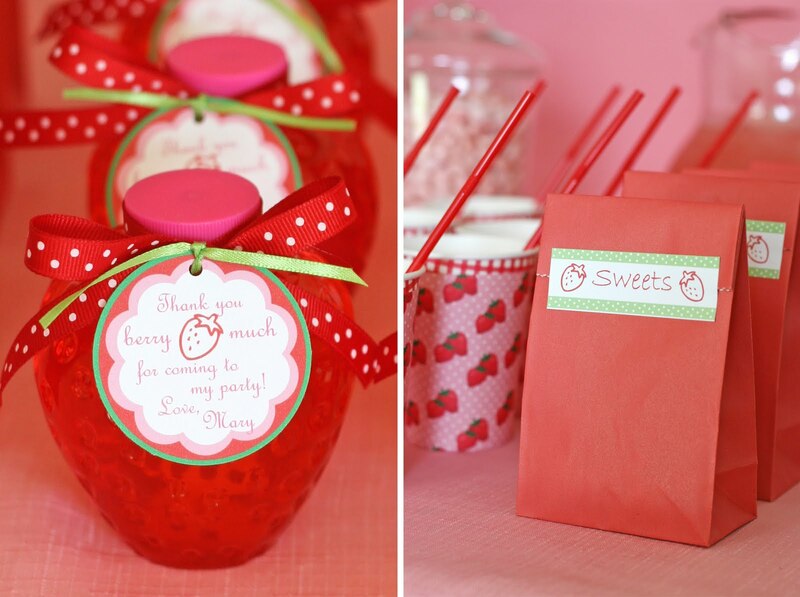 I love the perfect strawberry bubbles and handpicked strawberries the best…such lovely personal gifts! It's all so pretty. You are so talented! Hopefully Costco will have those ruffle plates again sometime. Sooooo sweet and delicious as always!! You did a FABULOUS job on this one, Glory! Beautifully sweet for precious little girls. Hi. This is beautiful! How did you gather the top tablecloth as you did? Thank you! @Sandy- I gathered the tablecloth by hand, and then used a safety pin to pin it in place. Then I pinned on the bow. Hi! I really love this party, so creative!! I wish portuguese people start making parties like this =)I hope they get inspired! I would give anything for that adorable pink tablecloth right now!! Such a cute party!! I know this post was last year, but I wanted to say what a wonderful party display you had. I would seriously think about watermarking your photos to deter those thieves! This is just gorgeous. May I ask, for the top tablecloth, did you wrap a whole length of ribbon around (and under it) and tie a bow, or was it done another way to use less ribbon? Thanks! 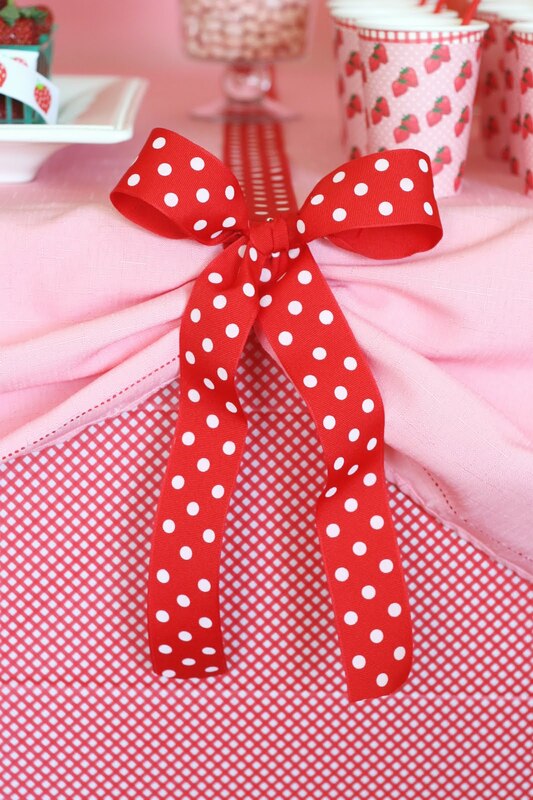 Melissa- The ribbon on the table is just laying on top, and then the bow is pined onto the gathered, pink tablecloth. Can you please provide your strawberry cupcake recipe? Also I would love to know where you found those beautiful cupcake stands. They have such simple elegance. Thank you. When I was a child (a LOT of years ago) I had this hang up about putting pink and red together. For some reason I carried that into adulthood … until today. These happy, delicious pinks and reds and cured me. hi! 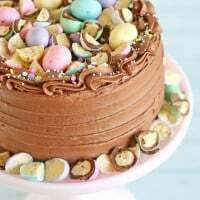 I love your creations, I wanted to know where did you bought your cake pedestals cause I cant find them anywhere!! 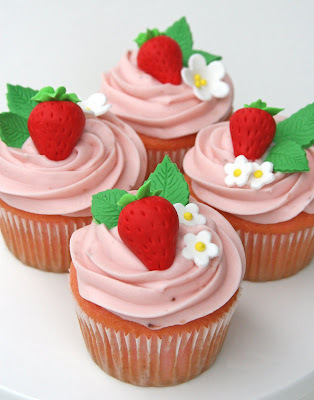 Do you have strawberry cupcake recipe? I have been looking all over for a good strawberry cupcake recipe, and have no luck! 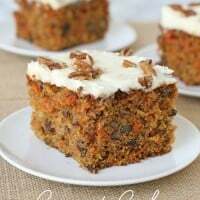 I have tried most of your cupcake recipes and love them! Hi Evadiva, No, I don’t yet have a strawberry cupcake recipe that I love. I often make vanilla cupcakes with strawberry cream cheese frosting (both recipes are posted on the blog), but I haven’t settled on a recipe for strawberry cake/ cupcakes yet. You rock! 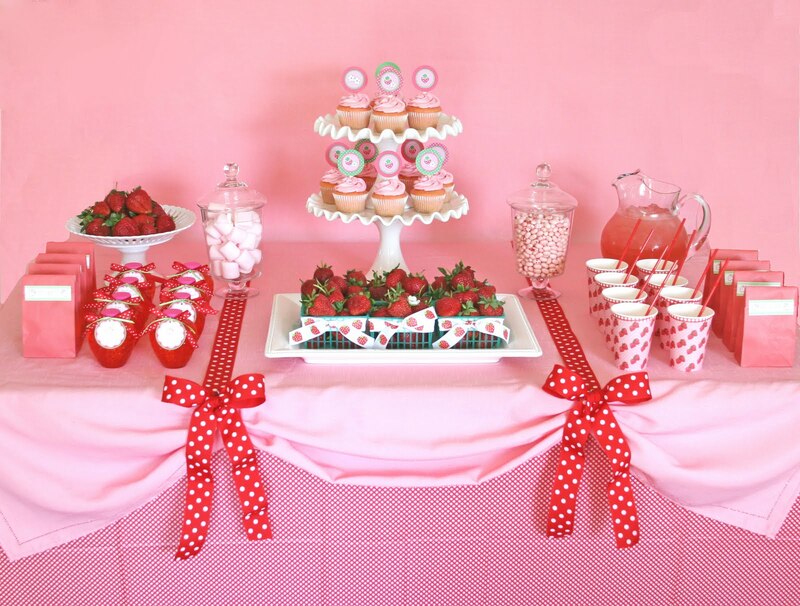 I’m amazed how you made a beautiful dessert table for an incredible price!! Ok- my husband would be saying thank you to you – showing how we can have desserts and favors that are attractive and not costly! We’re having my parents 45th anniversary in October and my sons 3rd birthday in November- I’ll be shopping at dollar places and Michaels( just up the road) I will also look at what I already have too- as well as my Mom and sisters for ribbon and cake and dessert plates! Hi! This is so cute! How did you gather the top tablecloth and attach the ribbon to the table!? Hi Reshele, Thanks! The strip of ribbon laying on the table is separate from the bow, so I cut that and laid it on the table first, then scrunched up the table cloth and used the end of the ribbon to loop over the scrunched up table cloth and used a safety pin to secure it. Then I made the bow and used a pin to hold that as well. Hope this helps! This is so pretty! I am planning a strawberry themed mini party for my daughter’s 2nd birthday. I hope I’ll be able to create a beautiful dessert table like the one you did. Where is the strawberry cupcake recipe?